Editor’s note. This is excerpted from a post that appeared December 6. The announcement of President Donald Trump’s selection of Dr. Maureen Condic for his administration’s science advisory board sparked outrage among abortion activists. Condic is an associate professor of neurology and anatomy at the University of Utah School of Medicine, where she has been since 1997. With a successful career studying neural development and providing expert testimony to state and national legislative bodies, Condic’s appointment to the National Science Board seems apt. Yet, abortion activists are outraged because Condic has publicly testified about the science of fetal pain. What the controversy reveals is that abortion on demand requires adherents to ignore the clear personhood, development, and Right to Life of the preborn baby. 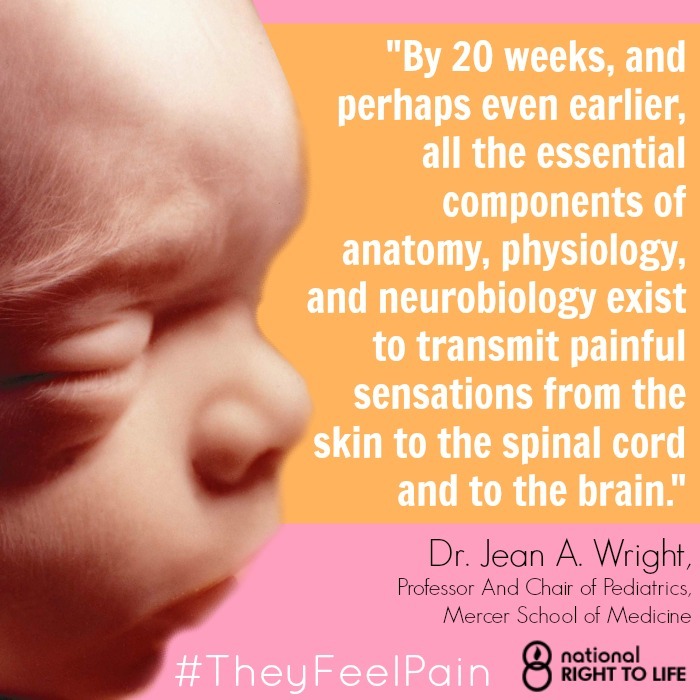 Science demonstrates that Life begins at conception and preborn babies feel pain. But for abortion activists, loyalty to abortion trumps recognizing scientific fact. What has Dr. Condic done that is “dangerous”? She has testified in support of legislation, like that in Texas, which protects pain-capable preborn babies from a tortuous and violent death through abortion. These laws are a significant step toward acknowledging the full rights of preborn babies as human beings and the state’s interest in protecting preborn Life. You know, we’re all horrified by the pictures of the infants that were brutally killed by convicted murderer Kermit Gosnell. And yet we tolerate the same brutality – and even worse – for humans at 20 weeks of development. Imposing pain on any pain-capable living creature is cruelty, and ignoring the pain experienced by another human for any reason is barbaric. We don’t need to know if a fetus experiences pain precisely in the same way we do. We simply have to decide whether we’re going to choose to ignore the pain of the fetus, or not. It is entirely uncontested in the scientific and medical literature that the fetus experiences pain in some capacity from as early as eight weeks. This information has been found through scientific study, not, as abortion activists falsely claim, through Pro-Life activists manipulating data. Eller called Condic’s work “a coercion of science to forward a political agenda,” but the error seems rather to be on the part of abortion activists who refuse to acknowledge scientific evidence that calls into question the ethics and legal status of elective abortion. Dr. Condic responded to the Tribune, “I’m not reporting bad science. I’m reporting an interpretation of science that’s open to discussion.” At the heart of Dr. Condic’s interpretation is the basic theory of human rights that demands that we err on the side of Life. In no other circumstance would people assume that a person can be ripped limb from limb while her heart is still beating simply because we cannot get a first-hand account of the type of pain she is experiencing. This is precisely why abortion activists are so afraid of the Pro-Life movement’s successful lobbying for legislation that protects pain-capable preborn babies. The abortion industry does not want public discourse to turn to the child in the womb and does not want people to consider, often for the first time, the rights of a living child who can be killed in legal, elective abortion. Prenatal development is a continuum, and once people have accepted that we as a society cannot kill preborn babies who feel pain, they will likely begin to consider whether we can kill any preborn child. As laws passed in Texas continue to challenge the legal foundation of Roe v. Wade, we move toward not simply making abortion “completely illegal” but toward a just society that recognizes the rights of all human beings. The recent backlash from abortion activists against Dr. Condic’s appointment makes clear that some vocal ideologues in the medical community are committed to abortion before science. As Dr. Condic’s unflinching advocacy for pain-capable preborn babies has shown time and again, science is on the side of Life.